UC Browser is one of the oldest and best browser for mobile devices. It offer a customizable user interface, fast download manager which allows you to resume from pause, saved page function, powerful ad blocker and it's also very easy to use. 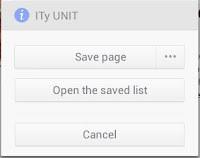 If you use UC Browser a lot, you would be familiar with the 10 tab limit when opening multiple tabs on the browser. While other browsers like opera, chrome etc. offers up to 20 tabs or more. UC browser has always been limited to just 10 tabs. With this latest December 2016 upgrade, UC Browser has increased the number of tabs on the latest version from the traditional 10 tabs to 20. So now you can open up to 20 tabs simultaneously on UC Browser. Aside the increase in tab limit, the latest version also comes with a more beautiful user interface. UC Browser saves it webpage directly to html which you can copy and open in any browser either on desktop or mobile. Perfect for saving that page offline to print later. 3. On the list of add-ons, select “Save Page”, if you don’t see the option, download the save page here and install, it will automatically integrate into the browser. 4. Open any page you wish to save and navigate through “Add-on” icon and tap on “Save Page”. On first run, you may be prompted to choose the location of the saved pages, if not; you always have the button to choose any save location. 6. Your webpage will be saved for offline browsing and you can as well navigate to the file and open it later with any browser. To enable fast loading, UC Browser tends to trim some features of a site and this makes some full featured site not to render well. On the whole, UC Browser is a great companion on mobile. You can also click here to read about the web version of UC Browser.